SAILOR Fleet One is the ideal complement to the new Inmarsat Fleet One service, which utilises the existing Inmarsat-4 satellite constellation to deliver satellite voice and data connectivity services that are ideal for use on smaller vessels and yachts. 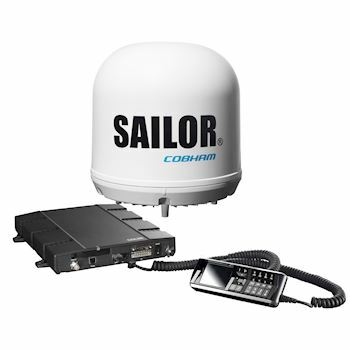 With its compact, lightweight antenna and simple installation, SAILOR Fleet One is a low-cost entry point to the world of maritime satcoms that keeps you connected at all times. SAILOR Fleet One enables data connectivity up to 100 kbps and voice calling on a single line. Its capabilities offer significant communications functionality for recreational and fishing users who need reliable voice communications and Internet connectivity on board, when cellular networks aren’t available, or just don’t offer the quality needed for good communication. The SAILOR Fleet One antenna is light and easy to install, even on small boats, and connecting to the below deck equipment is simple enough that keen owners can handle the installation and maintenance themselves. It may be small, but it packs enough power to deliver plenty of bandwidth for email, web browsing and social media sites.